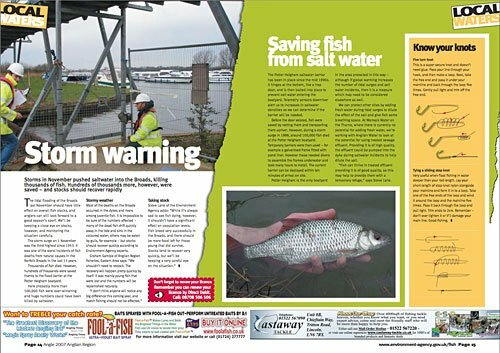 The environment agency produces a range of magazines it sends out to anglers – who are a major source of revenue for the organisation. Fishermen are also highly useful to the agency, because they can act as eyes and ears on the ground and raise the alarm if there are any problems with water quality. 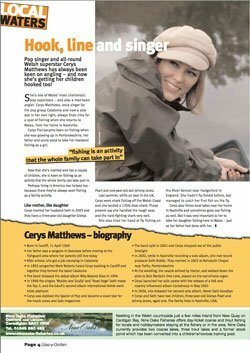 The magazines are therefore designed to be entertaining and useful on fishing matters, but also informative on environmental issues. I was asked to write a series of articles for the range of regional angling magazines. The brief was to get across useful information in an intelligent manner, while also creating articles that were readable and accessible to its audience. Of course, it also gave me a chance to try out a few fish puns here and there. The job entailed interviews with scores of people from Environment Agency scientists to reps from local clubs and even celebrity anglers. I also discovered the best way to catch fish – which apparently is to use electricity to stun them. Environment Agency specialists do this by wading into a river with a battery on their back, connected to an anode and a cathode. That way they can check fish stocks without harming the fish – or spending all day trying to hook them!